A 14th-century horror has met 21st-century science in the most recent research into the Black Death, the disease that claimed from a third to a half of medieval Europe’s population. The exact cause of the plague has been in dispute. Most scholars blame Yersinia pestis, a bacterium carried by flea-infested rats. Some scholars have argued that the plague was caused by the anthrax bacterium or an agent similar to the Ebola virus. The Yersinia pestis argument has gained ground since a team of scientists extracted DNA from the teeth of skeletons in a London cemetery devoted to Black Death victims. The scientists found Y. pestis and sequenced the bacterium’s genome—its entire record of hereditary information. They found that Y. pestis was the ancestor of all modern plague bacteria, but the strain that caused the Black Death no longer exists. That’s a good thing, too, since during the Middle Ages the Black Death killed an estimated 50 million people worldwide. Plague still affects about 2,000 humans per year, but the modern strain does not spread like the medieval disease did, and antibiotics are usually effective against it. Still on researchers’ to-do list, though, is finding the genetic reason why the 14th-century version of the plague was so much more powerful than its modern descendants. This work on Y. pestis is the first time that scientists have sequenced the genome of an ancient germ. The same method used for Y. pestis could be used to shed new light on other historical diseases, including predictions for their reappearance. This article summarizes the genome sequencing study. Read the full description of the genome sequencing story here. Get all the details, including information on other deadly outbreaks of plague, from Science Daily. Visit the cemetery of the Black Death victims and watch an interview with one of the researchers. 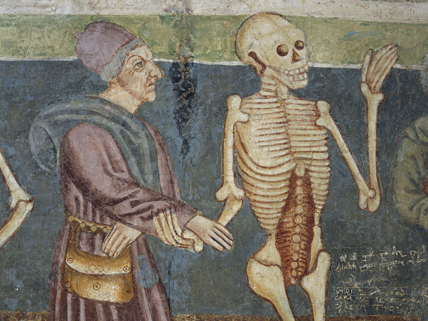 Review the facts about the Black Death at this site. Do you think this would be good for a school project? People in Europe were killed by a disease called The Black Death. The Europeians did not know why everybody were dieing. They thought that it was from flea infested rats, but it wasn’t! A team of scientists went to the grave of some of the people who died and got some DNA. The DNA that they got proved that the Black Death wasn’t from flea infested rats it was hereditary!!! ricky you are completely correct. ring around the rosy=swelling. pockets full of posey=herbs thought to cure it. ashes ashes= origionally atchoo atchoo= violent sneezing. we all fall down=short quike death that happened shortly afterword. I think that if I were to do a study on something, this would be it. I think this is the saddest part of mediveal history.